Salvation And Survival: Is Your Labor In Vain? Is Your Labor In Vain? There are two different aspects of this doctrinal position. The first is the issue of inheritance and rewards. Colossians 3:23-24 says it pretty plainly: Whatever you do, work heartily, as for the Lord and not for men, knowing that from the Lord you will receive the inheritance as your reward. You are serving the Lord Christ. That word "work" signifies "labor", and obviously, when we work hard for the Lord, we can expect rewards from Him. But that is not the aspect I want to address today. I want us to think about Jesus's heart in this matter. In Matthew, Chapter 9, we get a very good picture of His heart when it came to healing people. In this short chapter, we see Him healing a paralytic; the daughter of a synagogue official; a woman who had been hemorrhaging for twelve years; two blind men; and a mute, demon-possessed man. At the end of the chapter, it says He went "through all the cities and villages, teaching in their synagogues and proclaiming the gospel of the kingdom, and healing every kind of disease and every kind of sickness". And then, in the last verse, it tells us why He healed them all ... He had compassion on them. That word compassion, in the Greek, literally means to have the bowels yearn. The bowels were considered by the Hebrews to be the seat of tender affections, so the fact that Christ felt "compassion" means He was so moved with tender mercy for the multitudes [who needed healing] that He physically felt it. But it is the last two verses of Chapter 9 that I hope will dispel the Church's sacred cow regarding "works". In verses 37 and 38, after seeing the multitudes who cried out for healing, and feeling mercy to His very core, Jesus turns to His disciples and says, “The harvest is plentiful, but the workers are few. Therefore beseech the Lord of the harvest to send out workers into His harvest.” Can you grasp the immensity of this situation? The Greek word for "send out" is ekballo, and it means "to throw out", "to cast out", "to drive"... all with force and effort. It is the same word used when referring to casting out demons, and denotes the intensity and the need for the action. Here, in Matthew 9, Jesus is saying, "There is such a multitude [or plentiful harvest] that need healing and delivering and saving, that I can't get to them all. Please ask the Lord to send out [with intense force and effort] workers and laborers to gather His Harvest [of lost and hurting souls]." At this point, it is evident that Jesus is not concerned about how skilled the laborers are -- it is about how much time we have to save the harvest. If we don't gather the harvest, the harvest will die! How true is that today??? How many people need to hear us preaching and teaching the Gospel of the Kingdom so that they can receive God's grace and avoid the fires of hell? How many people need to hear the message of the Gospel and God's Kingdom on earth so they can be healed from the Enemy's spiritual oppression? How many need to feel the power of Jesus in our hands as we heal their physical illnesses? Are we, as Jesus's Church, doing what He asked those disciples to go and do in Matthew, Chapter 9? Do we think the need is any less today than it was 2,000 years ago? You see, the Modern Church puts the emphasis on the readiness of the Laborer [if they even consider that work needs to be done, in the first place]. They will say, "We can't get out ahead of God!" "We better be careful -- we might make a mistake, and make it worse!" "We just need to Wait!!!" But Jesus's emphasis was on the readiness of the Harvest. There are people who DESPERATELY NEED the Message of the Kingdom, and healing, and casting out of their demons. As the Church, we don't need to wait any longer for a special sign from Heaven! If you believe it is truly Jesus doing the work in and through us, then you're ready to wade into His Harvest. The Church is still waiting for a door to be opened for them. But Jesus said, The gates of hell will not prevail [against My Church]. So, what does that tell us? Hell has gates! And Satan is not going to willingly open the door or gate for us! Sometimes we have to kick some doors open! Sometimes I get the impression that the Church is waiting for Heaven to open up and give us permission to delve into the spiritual aspects of the Kingdom. But Heaven opened up the minute Jesus returned to His Father and the veil was torn away! Heaven opened and received Him -- and it has never closed! It is very clear by Jesus's instructions to us as His disciples that we are the conduit between Heaven and earth. He has given us a commission to bring in the harvest before it withers away and dies. We are to engage with those who are hurting and need healing, and that means we will have to engage with the darkness in this world [because it is the darkness that is oppressing both believer and unbeliever, alike]. But the Church only wants to take The Light where it's already light. We're afraid of the dark! But our examples are Jesus and those disciples who went forth to preach and teach the Gospel of the Kingdom. [NOTE: Jesus didn't preach about His death, burial, and resurrection -- i.e., the Salvation Message -- and neither did He tell these early disciples to teach the Gospel of Salvation. He didn't reveal that until right at the end of His life and ministry]. But Jesus and these disciples taught the multitudes about the Kingdom of God; about the reign, rule, and superiority of God. And then they demonstrated what they preached ... they healed, and cast out demons, and proved that YHWH is superior to any demon or power of Satan. Isn't that the same message that needs to be heard today? And don't you think that those same lost multitudes exist today? That the Harvest is plentiful? And can you see the need for Laborers in this massive Harvest? So, are you willing to work heartily for the Lord of the Harvest? Or are you content with containing His Light in your comfortable surroundings? 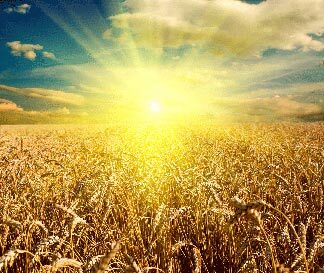 Jesus said the Harvest is plentiful ... God is waiting for us to move into the fields and begin sharing the Gospel of His Kingdom and doing the works as His ambassadors. His Word says that by our fruits He will know us. The harvest is ripe and there are multitudes waiting for us -- all manner of illnesses and diseases need to be healed; demons need to be cast out; and the power and authority of Heaven [through the Holy Spirit] is waiting to permeate every new disciple of Jesus Christ -- all in His mighty and compassionate Name. It's almost Harvest Time -- Are you practicing your faith by laboring for the Kingdom of God -- or is your faith absent of useful aim or effect; void of results for the Kingdom? We will all have to account for our works when we stand before Him. I beseech you -- Do not labor in vain! 1 Corinthians 15:58 "Therefore, my beloved brothers, be steadfast, immovable, always abounding in the work of the Lord, knowing that in the Lord your labor is not in vain". This was a good one Belle, I like how you make me take a different look from a different angle every time. Every scripture seems totally new and different with power and authority as the center piece. Thank you! Thank you, but it is really the Holy Spirit who is challenging me to know what I believe and why. I am really trying to form my theology according to the truth of Scripture and the meaning of the original words and context. And I am constantly fascinated with what God is sharing!